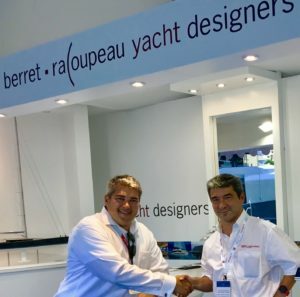 Fountaine Pajot recently announced the new Power 67, a version of the Alegria 67 sailing yacht that made its North American debut during the 2019 Miami International Boat Show in February. This highly anticipated power version will likewise make its North American debut at the 2020 Miami International Boat Show. The Alegria 67 trampoline will be replaced by a fully covered hard deck. The sailing rig will be removed and a 3’ tall SS railing will be installed. A wider stern to accommodated proper motor catamaran hull form. Increased engine size to 300hp or 435hp. Added a retractable Flybridge hardtop and SAT COM ARCH. Two versions will be available: the Maestro and the Charter. The Maestro sleeps 8 to 16 people with one Owner’s Suite and three or four VIP Guest Suites. 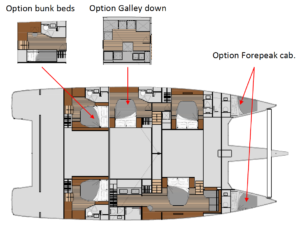 There is an option for galley down and two Forepeak cabins. The Charter version sleeps 12 to 18 people with six VIP Guest Suites and the option for galley down and two Forepeak cabins. 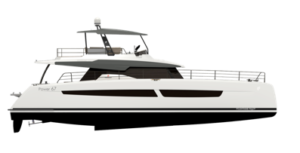 In comparison to motor yachts of a similar size, the hull design of the Power 67 offers greater performance and seaworthiness. The widened stern lines and increased engine sizes offers the unique opportunity for long range cruising. 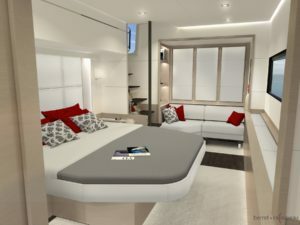 The 118 square foot cockpit provides generous living space with comfortable sofas, benches, and sunbeds. The hardtop roof provides a well-protected area to welcome passengers in the best circumstances and the large table offers accommodations for eight guests. Thanks to the large sliding glass door, the cockpit opens to the indoor saloon for easy circulation and socializing. 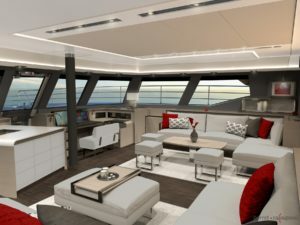 From the cockpit, a staircase will take you directly to the Flybridge. Two helm stations provide great comfort to the skipper at sea and for docking. It offers an unprecedented ocean view. Guests will enjoy a 360° view from the reception area from their seat on the generous sofa. The hardtop over the Flybridge is equipped with a sliding roof opening and reserves a special spot for a satellite antenna. 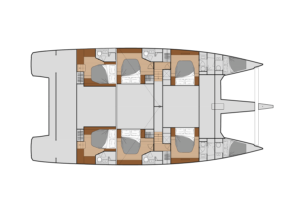 The front deck of the Power 67 provides an extended 148 square foot space for convivial moments with an optional hot tub, reception area, and sunbeds. The exceptional area has direct access to the salon through a sliding door. A high rigid guard secures the yacht all-around at deck level and on the Flybridge. Contact me at 954-732-5825 or email james@atlantic-cruising.com to learn how the incredible new Power 67 from Fountaine Pajot can be yours. I have access to a December 2019 slot with 2019 tax year qualifications. While working with Atlantic Cruising Yachts, winner of the 2018 Fountaine Pajot Dealer of the Year Award, you’ll receive highly personalized attention in your journey to ownership. With over 40 years of commissioning experience, you can expect only the best at every step of the process. We provide innovative solutions to reduce the cost of yacht ownership with our boutique network of qualified charter destinations called Waypoints®.